With Greenbuild 2017 just over three months away, now is the perfect time to celebrate the success of just a few of the green building movement’s most innovative architecture and design firms. We hope their work in LEED and SITES inspires you, as you prepare to come to Boston. ZGF Architects considers stewardship of both the built and natural environment a core principle of their business. Masters of designing for integrated functionality, aesthetics and sustainability, ZGF’s projects are known for their ability to transform client needs into an experience that transcends expectations. 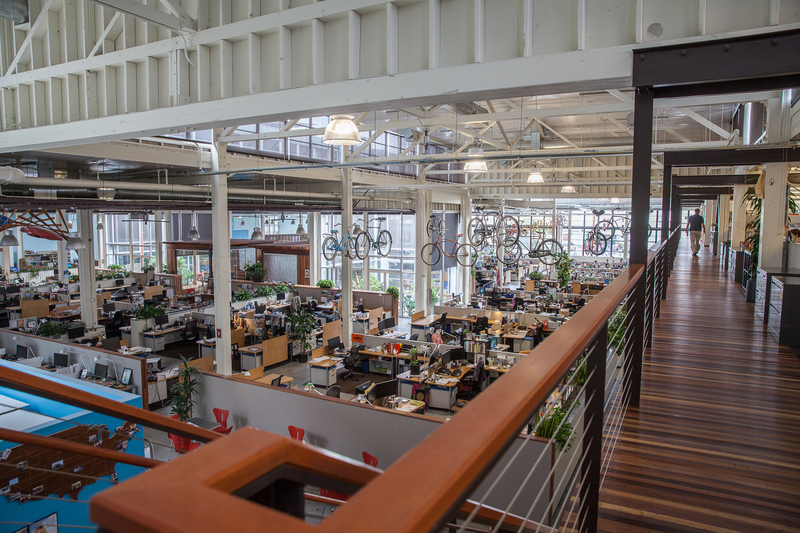 The Clif Bar Headquarters in Emeryville, California, achieved LEED Platinum for Commercial Interiors in 2012. The multi-use office space is housed in a former World War II valve factory. Making strategic use of the natural light spilling down from the clerestory windows and incorporating four interior courtyards, it is an ideal workspace for nature enthusiasts. With bikes hanging from the rafters as decoration, and more than 12,000 board feet of reclaimed wood, the space is at once elegantly natural and adventurous. Photo Courtesy of Peter Prato/Clif Bar & Company. The firm behind sites that are quickly becoming iconic examples of landscape design, like The High Line in New York, James Corner Field Operations weaves together familiar and foreign elements to create places that defy classification. The firm believes in designing urban spaces with people in mind. Working with existing natural elements rather than attempting to control them, the Field Operations team coaxes out the best sensory experience out of every location. 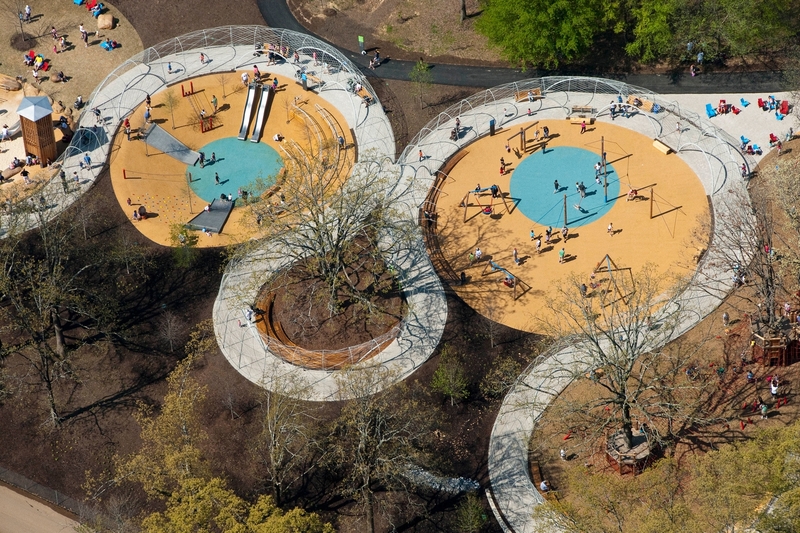 The Woodland Discovery Playground of Shelby Farms Park in Memphis, Tennessee, was one of the first projects to achieve SITES certification. Built on a former greyfield, the playground encourages children to engage with their environment and with each other. Located on the edge of a wooded area, the playground is integrated into its natural surroundings, providing a sense of flow that is rare in constructed outdoor public spaces. The playground reflects best practices in sustainable landscape architecture as well as child development. Photo Courtesy of James Corner Field Operations. Michael Maltzan Architecture (MMA) operates with a fundamental belief that the built environment shapes our experiences and interactions. The firm envisions urban and public spaces that alter perceptions, and using space and design to engage entire communities, MMA’s body of work represents a fresh way of looking at architecture. In 2016, MMA completed the Crest Apartments, a 64-unit affordable housing community with shared social spaces designed for the Skid Row Housing Trust. The project, which houses formerly homeless veterans, is designed to encourage interaction and the provision of support services to reduce the risk of reversion to homelessness. The project achieved LEED Platinum under the LEED BD+C Multifamily Midrise adaptation in early 2017. Prioritizing natural lighting, energy efficiency and healthy materials, MMA created a space that supports the health and well-being of its residents. Want to see great examples of creative, sustainable architecture in the Boston area? Check out the Greenbuild green building tours on Mon., November 6; Friday, November 10; and Sat., November 11. You can explore parks, sports venues, neighborhoods and campuses, to name just a few.